PRINCETON, NJ - Democrats and those who lean toward the Democratic Party are significantly more positive than Republicans and those who lean Republican about a number of U.S. business and industry sectors, including the federal government, the movie industry, education, publishing, the legal field, healthcare, and the automobile industry. 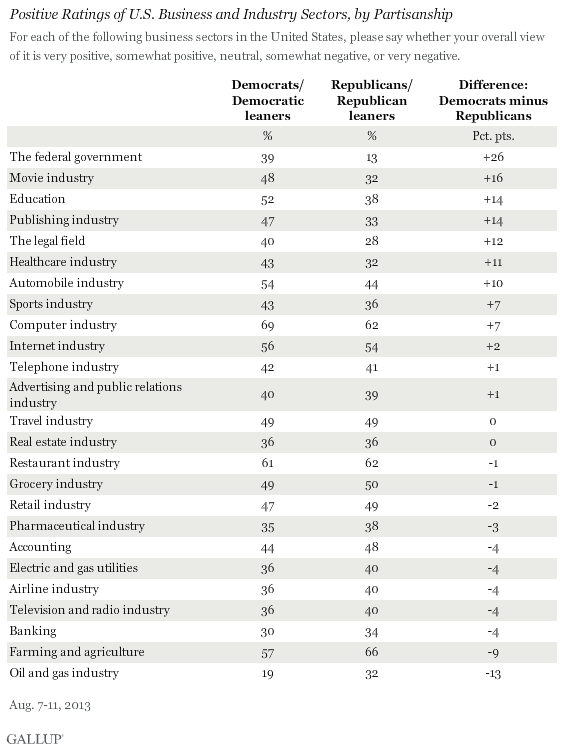 Republicans are significantly more positive than Democrats about two sectors: the oil and gas industry and farming and agriculture. The results are based on Gallup's Aug. 7-11 Work and Education survey in which Americans reported their overall impressions of 25 business and industry sectors, using a five-point scale ranging from "very positive" to "very negative." Overall, Americans rated the computer, restaurant, and farming and agriculture sectors most positively. The oil and gas industry and the federal government were rated most negatively. The current analysis focuses on the percentage of Americans who gave each sector a very or somewhat positive rating. No single reason explains all of these partisan differences. While some may reflect clear ideological differences between Republicans and Democrats, others may be a function of differences in the demographic make up of the two parties. Democrats' more positive ratings of the federal government could be due, in part, to the basic partisan differences in views of the role government should play, although they also reflect the fact that a Democrat is now president. By comparison, Republicans were more positive than Democrats in their rating of the federal government in 2008, when George W. Bush was in the White House. Democrats' more positive views of the movie industry may reflect differing attitudes about the types of movies coming forth from Hollywood, reactions to the liberal causes espoused by some high-profile movie actors, or possibly higher support for creative and artistic endeavors among Democrats in general. Democrats also skew younger than Republicans overall, and young Americans are more likely than their older counterparts to rate the movie industry positively. Higher ratings for the healthcare industry among Democrats are most likely due to the major partisan divide over the Affordable Care Act. Republicans were more positive than Democrats about the healthcare industry in 2007, before President Barack Obama and Democrats in Congress made healthcare reform a key part of the Democratic Party's platform. Republicans are generally more supportive of using traditional sources of energy like oil and gas, which helps explain their relatively higher regard for the oil and gas industry. Still, this sector is near the bottom of the rank-ordered list for both groups. 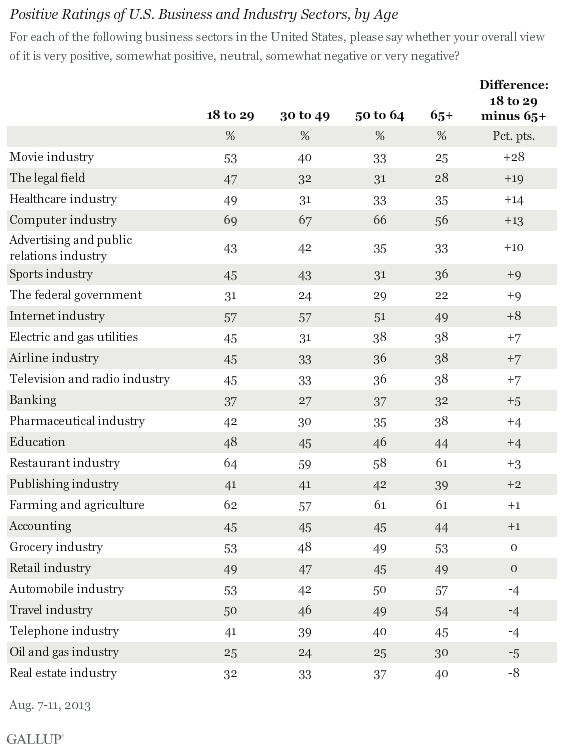 There are significant differences by age in Americans' ratings of seven of the 25 industry sectors Gallup measured. In each of the seven instances, 18- to 29-year-olds give the sector the highest rating and those aged 65 and older give the sector the lowest rating. The biggest age skew is in ratings of the movie industry, but younger Americans are also more positive about the legal field, healthcare, the computer industry, advertising and public relations, sports, and the federal government. The age differences in Americans' views of the movie and computer industries most likely reflect differential use patterns across the age spectrum. Young people are more likely to identify as Democrats than those who are older, which may help explain younger Americans' more positive view of the federal government. It is not immediately clear why young Americans are more positive toward the legal or advertising fields. The large partisan differences in Americans' attitudes toward a number of business and industry sectors can have meaningful and important consequences. Government actions affect all of these industries, and rank-and-file voters' views of the sectors can percolate up through to party leaders and elected officials who make policy decisions. For example, Democrats' more negative view of the oil and gas industry could influence Democratic officials' decisions on funding alternative energy sources. The 14-percentage-point difference in positive views of the education sector between the two parties could affect whether or not lawmakers support education policies, such as that proposed by President Obama on Thursday to institute a new college rating system tied to financial aid. Democrats' more favorable views of the legal field could relate to Democratic lawmakers possibly resisting government reforms to the legal system, such as limits on malpractice and lawsuit rewards. And the fact that there are no significant partisan differences in views of such key sectors as banking and pharmaceuticals could, at least in theory, mean that government actions toward those industries would not be subject to as much partisanship. Of course, most of these business and industry sectors are directly affected by consumers' actions, and in that regard, the younger Americans' more positive views of some sectors could have financial implications, particularly in terms of movies, computers, and sports. The fact that younger Americans hold certain industries in relatively high esteem could also affect their career choices. As young Americans hunt for jobs, they may view jobs in the computer and restaurant industries more favorably, and see jobs in the oil and gas and real estate industries as less favorable choices. For results based on the total sample of 874 adults who identify with or lean towards the Democratic Party, one can say with 95% confidence that the margin of sampling error is ±4 percentage points. For results based on the total sample of 913 adults who identify with or lean towards the Republican Party, one can say with 95% confidence that the margin of sampling error is ±4 percentage points. Sample sizes for the four age groups are 298 18-29 year old adults, 506 30-49 year old adults, 599 50-64 year old adults, and 617 adults 65 and older. Margin of sampling errors for these groups range from 7% for the smallest group to 5% for the larger groups. A majority of Americans say higher health insurance rates for smokers are justified, but fewer support higher rates for significantly overweight people. Support is lower among smokers and the overweight for policies that affect them.